The holiday’s are always an extra special time of year. There are the obvious reasons of embracing the peace, love and joy of Christmas. One of the other important aspects of the holidays is the focus on family. The kids are off from school and everyone is taking off work to enjoy some quality time. The stress of everyday life seem to disappear as we bond over the holiday spirit. Things like baking cookies, cuddling on the couch while watching Christmas movies and making special visits to see relatives become priority. It’s the perfect time to take a winter weekend getaway. For the past five years our family has been traveling down to Williamsburg for our annual visit to Busch Gardens Christmas Town. Here’s why you won’t want to miss visiting during this festive time of year! Christmas Town is the perfect weekend getaway for families (especially with the park being less than a three-hour drive from Southern Maryland.) If you’ve been to Busch Gardens Williamsburg before you probably will agree that it is one of the most beautiful theme parks in the US. The amusement park follows the theme of touring European Countries such as England, France, Italy and Germany. During the holidays these quaint European villages are decorated in its traditional style with over 8.3 million Christmas lights, over 1,500 fresh-cut Christmas trees, 20,000 ornaments, and over three miles of garland. It is truly a breath-taking scene to see the park lit up at night. Normally when we arrive to the park we start our day in Scotland and visit Highland Stables; where you can interact with Clydesdale, blackface sheep and their Border collie guardians. We than make our way over Tweedstation to take the first train that embarks around the park. The nice thing about showing up early is that you get to watch the train pull into the station. Since it’s the first train the conductor gives plenty of time for guests to arrive and board the train. While idling in the station you can walk down to the engine to see the beautiful locomotive and get your picture taken with the engineer. Last year we were touched by the generosity of one of the engineers. He saw that my oldest son loved Trains, reached into his pocket and pulled out a small gift. Receiving the small toy train made his face light up with pure joy. This is just one example of how the staff here go above and beyond to make our visit special. One of the great things about Bush Gardens is that you can use the train ride and the skyline as not just a fun ride but as transportation around the park. The train has three stations Tweedside (Scotland), Jingle Junction (Italy) and Caribou Crossing (New France). The skyline will take you from England to France, France to German and Germany to England. I highly recommend riding the skyline at night. It is so beautiful to see the lights from above. There are so many amazing shows available at Christmas town. This year the following shows are available this season: Scrooge No More! at the Globe Theater, Gloria at the Abbey Stone Theater, Twas That Night at the Royal Palace, Deck The Halls at Das Festhaus and O’Tannenbaum at Festhaus Plaza, Gift of Harmony in Italy, Santa’s Workshop in North Pole and Rudolph’s Winter Wonderland in Holiday Hills. All the shows at Busch Gardens are amazing though. Despite that it can be done, it is hard to see all the shows in one day. We usually pick three performances to see, that way we still have time for rides. We always try to make sure that we see the show Gloria first before we do anything else. Gloria! Is a musical that retells the Biblical Christmas story; all done with amazing vocalists, special effects and a full orchestra. I’m always blown away by the extraordinary talent, not to mention amazed by the special effects such as moving platforms that create a walking or floating effect. This show brings the Christmas miracle to life. The show performs inside the Abbey Stone Theater in Ireland, so it’s a great way to stay entertained and warm. Deck The Halls is an upbeat musical that features classic holiday songs at Das Festhaus indoor dining hall. O’ Tannenbaum is a majestic 50-foot Christmas tree with a multi-colored spectacular light show, located right in front of Das Festhaus. Gift of Harmony is new this year and takes place outdoors Italy’s Il Teatro di San Marco Theatre; listen to favorite traditional and newer Christmas sung a cappella. Scrooge No More is a fun musical that retells the classic tale of Scrooge in the Globe Theatre. ‘Twas That Night performs on the outdoor Royal Palace Theatre stage that is transformed into a full-scale ice show. This show re-imagines the magic of Christmas Eve and the classic poem A Visit from St. Nicholas. World-champion figure skater Elvis Stojko brings this beloved Christmas story to life, on ice. The park also features a number of street performers, including carolers in England and jesters in France. Don’t miss visiting Santa at his new location where Darkastle is transformed into Santa’s Workshop. The decor and santa’s helpers make Santa’s workshop come to life. My boys enjoyed talking to the Elves and Toy Solider. The line can get long. I suggest going after dinner when the line is less intense. The setup is really nice… you get tour the workshop, meet Santa and have your photo taken. Photo packages are available at the end of the tour. I’m always amazed at all the rides that are open during Christmas Town. My boys love spending a great bit of time in Sesame Street Forest of Fun. Thrill seekers daring to defy gravity will enjoy riding the rollercoaster Tempesto or the new InvadR; while Grover’s Alpine Express offers a family friendly coaster experience suitable for our smaller guests. For rides that young children can ride alone be sure to visit Italy and check out Davinci’s Little Glider and Little Balloons. The Kinder Karussel (carousel) and Der Autobahn (bumper cars) in Germany are always another big hit. There’s more than lights, rides and shows at Christmas Town though. There are a lot of really cool shops and believe it or not the food options are pretty amazing too. Your options include; Dickens Tavern in England, Ireland’s Grogan Grill, Trappers Smoke House which smells heavenly as you walk through New France, Das Festhaus where you can watch Deck The Halls while you eat, Dashers Diner in Holiday Hills or Marco Polo’s Market Place where you can watch Gift of Harmony while enjoying a warm meal. We usually try to step inside to warm up at Das Fest Haus because we love the upbeat show and festive food. Santa’s bigger and better workshop: Santa and Mrs. Claus went house shopping and found a larger home in the Curse of Darkastle building. This more spacious whorkshop allows for more children to meet jolly ol’ S.t Nick, take pictures and drop off their Christmas wish lists. Gift of Harmony: This show in Italy features a modern a cappella sound with stunning and complex vocal performance by a group of talented singers. The musical set will include traditional songs and newer holiday favorites. Rudolph’s Movie Experience: The story of Rudolph and his friends is re-told in a special 12- minute movie presentation in Holiday Hills that immerses you in a vibrant special effects, delicious scents and dazzling lights. Cookies & Cocoa: This new shop at the North Pole serves an assortment of cookies, cookie decorating kits and our specialty hot chocolate. Planning ahead If you can, give yourself an option of a couple of days to visit for weather. Be mindful that if there are freezing temperatures some of the rides shutdown. That being said every year we’ve gone we have always had beautiful weather for visiting the park. Tickets- Consider purchasing a “Bounce Pass” which will allow you to bounce between Colonial Williamsburg and Busch Gardens Christmas Town for three days. Keep in mind you still have to pay for parking. Be on the look out Groupon sometimes has discounts. Busch Gardens also offers specials so check in on their site frequently. Shows– Seeing a show is a great way to keep the kids entertained while staying warm. Dining– The price range for food and beverage are typical for an amusement park. One thing to keep in mind is that you can purchase refillable cups you can purchase for fountain drinks and even hot cocoa. Since Busch Gardens is a family friendly park they do allow Snacks from outside the park. We usually pack a few water bottles and snacks for the kids but enjoy dinner at one of the dining halls. Lights– Take time to view the lights displays around the park; be sure to stroll through the “cascade” of lights down the Polar Pathway and Peace on Earth display as you cross the bridge that leads from German to Italy. Dress for the weather– I think one of my biggest pieces of advice is to dress in layers. We usually dress the boys in layered warm clothing with a coat, hat and gloves. A few shows and Das Festhaus are indoors, mostly everything is outdoors. Most years when we’ve been it is deceivingly warmer during the day but drops in temperature drastically at night. There are warming stations that you can keep an eye out for too! Stroller– You can bring you stroller with you, as there are plenty of places to park and ride. However, if you don’t want to hassle with loading a stroller on the train or skyline you can rent a stroller. This way you can park the rented stroller in the designated spots and grab a new one once dropped off at the next station. They are inexpensive and fit two kids, plus your gear! Since there is a lot of heavy walking you will find little ones can get tired. There are a variety of lodging options in the Williamsburg area. Our family recently visited Williamsburg this past weekend and treated the kids to a stay at Great Wolf Lodge. The kids loved staying at this resort; especially since it features an indoor water park. We spent many hours relaxing in the lazy river, taking a dip in wave pool and making a splash down the many water slides. The holiday season is the perfect time to stay at Great Wolf Lodge. I love how the entire Lodge from the inside out is adorned with whimsical winter decorations. There are many special activities to celebrate the holidays including: photos with santa, snow fall in the lobby and fun festive crafts. We really enjoyed voting for our favorite decorated tree and completing the holiday scavenger hunt for a prize. One of my biggest suggestions for families on a budget is to get a standard room which is anything but basic! Our room came with two queen beds and a semi separate living room with pull out couch. I love that the room had a fire-place; which really made the room feel like a cozy retreat. By saving money on your room you will have a larger budget to splurge on extras. I highly recommend visiting the arcade and Magiquest; they are a lot of fun and the perfect activities for family bonding. If you have time, I highly suggest visiting the spa which has relaxation packages for adults at Element Spa and options for the younger crowd at Scoops. They have the most adorable services available no matter what the budget! Your little princess can get treated to a royal sprinkle for only $10. My boys treated mommy to a manicure and pedicure and then got a bath bomb for their bath back in the hotel room. The Playful Parent has also enjoyed other hotels; our favorite hotel options are the sister Marriott properties Residence Inn and SpringHill Suites. See the Playful Parent Marriot Williamsburg Guide for more information. We have every intent on getting back down to Williamsburg this winter at least one more time and the kids expect to stay at our traditional location where they enjoy the beautifully decorated lobby, indoor swimming pool and complimentary hot chocolate! You can’t go wrong with staying in a luxury suite close to all the attractions in Williamsburg. How fun! I would LOVE to go here during the winter. We were here during the summer and went to Colonial Williamsburg and had a blast. I bet it’s gorgeous there in the winter. It has been something like 18 years since I’ve been to Busch Gardens (Wow! Even longer than I thought when I sat down to do the math! ), so I had no idea they had something like this for the holidays. I always loved visiting for their Halloween even, but this looks like something great for those who don’t like the haunts. I definitely need to go back so I can experience Christmas town . That looks like a really great place to visit during this time of the year. I wished we were closer so we could go more than once! Wow. Christmas Town looks amazing. I love that they include nativities and the real Christmas story along with Santa Claus. Aww look at all the festive pictures and decor! The place looks amazing and sounds so much fun! Wow, the place looks very gorgeous. I have never experienced winter at Busch Gardens. I hope I can visit and enjoy a winter Christmas holiday at Busch Gardens this year. Oh my goodness what an amazing place to go to for a winter getaway, it looks like it would be so magical in the run up to the Christmas season. I truly love this post. It sounds so similar to what we do and how we feel about the Christmas holiday. We will definitely visit Great Wolf Lodge during the break. We live a little closer then the 3 hours it takes you to get here. 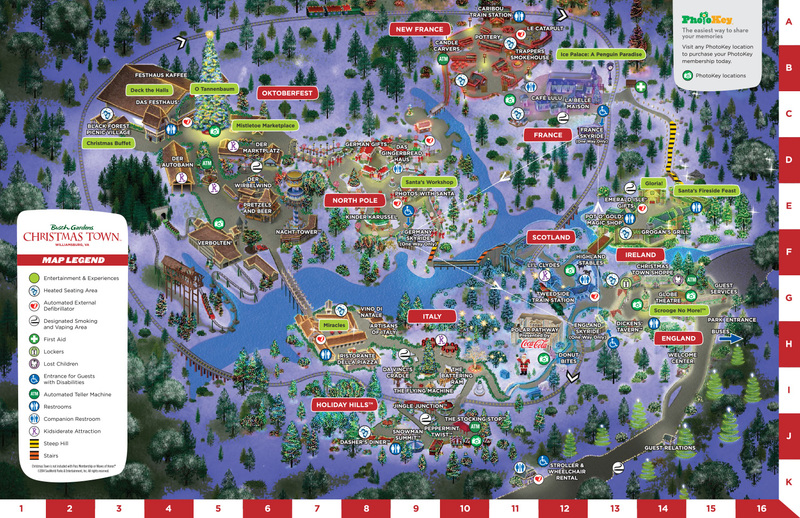 I have never been to Christmas Town but do frequent Busch Gardens in the summer. The same goes for Great Wolf Lodge. I have been in the spring and summer but not in the colder months. Wow this place looks amazing.. Never been here but would love to visit here once.. Hope you guys had fun..
I’m originally from VA, but I’ve never seen Christmas Town!!! You have given me something to do with my family this year. It looks so festive and whimsical! Christmas Town looks so fun and whimsical. I bet my kids would find it entertaining. The lodging options look great as well. We will check this out, thanks for the winter break idea! It sounds so much fun! My daughter will love it! I think you just inspired me to visit Williamsburg again. Did you take these pictures on your phone or camera? I’ve been to Busch Gardens, but have never seen it like that. Thank you for the tour! Thank you! I used my DSLR Nikon to take photos. It truly is an amazing park and Christmas time is my favorite time of year to go! Oh my! This looks so much fun for winter. My kids will definitely love this here. This looks like it would be such a magical experience. I have always wanted to take my kids to Williamsburg. Details: My favorite thing to do in the fall is visit a local farm. Nothing is more fun than going for a hayride, getting lost in a corn maze or picking the perfect pumpkin. See the Fall Guide for a list of farms and events happening this fall. Many of the farms are opening on weekends only; however, some are opening during the week day. You could also schedule a visit with a few friends or group for week day fun. A few that are always open to the public on weekdays include: Cox, Greenstreet & Montpelier. Details: Drop off boxes are located in the lobby of the Waldorf and Clinton offices. All costumes will be delivered to FB Gwynn Center. Details: This story time encourages emerging literacy skills through books, songs, fingerplays, and flannel board stories. It is designed for 2 and 3 year olds and their parents. This is a 30 minute program that includes a simple craft. Open style sports and semi-organized games. Registration form with parental consent required each school year. Sign-in by youth required each day of participation. Dates and times subject to change. Contact the center for schedule changes.